Nelson Rolihlahla Mandela lovingly referred to as Madiba, was on a rush visit to Nairobi on a cold July morning in 1990. It was rumored that he was gravely ill from pneumonia and was visiting one of our elite private hospitals for personal medical care .. 27 years on a prison island can take a physical toll on any human body. We were marched off from class in pairs of 2, holding hands to wave at the great man as he passed by our school. It was traditional that foreign dignitaries in presidential motorcades be greeted by eager flag waving kids wherever they went – it rejuvenated our President and bolstered his ego. I was given a Kenyan flag to hold and given a spot right by the roadside. As minutes turned to hours my initial excitement turned into restless anxiety and then boredom. The teachers insisted we practice waving flags so as to keep us occupied. Just as the teachers were losing hope – a policeman zoomed by on his BMW motorcycle. The kids arose in anticipation, then another motorcycle, then five more – the policemen were immaculately dressed with their shiny bikes and their white kidskin gloves. Mandela was on his way. The presidential motorcade sped by us like lighting as we peered back eagerly trying to capture a glimpse. Then it happened. A frail old man with a feeble smile and piercing eyes raised his hand and looked out of the black Mercedes limousine. It was him. Mandela had smiled at us – for an 11 year old it was the closest I had come to history and although I didn’t realize it then something powerful had just taken place. 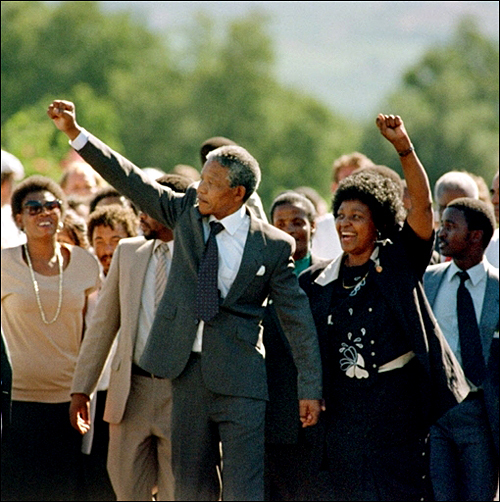 Mandela has come to signify the African spirit. Even at his frailest he had the presence of mind to acknowledge the kids who stood 2 hours for sight of him – Mandela cared. His steady gaze diminished all doubts that his love for life was waning and that he would return stronger. This was my first glimpse of Nelson Mandela.